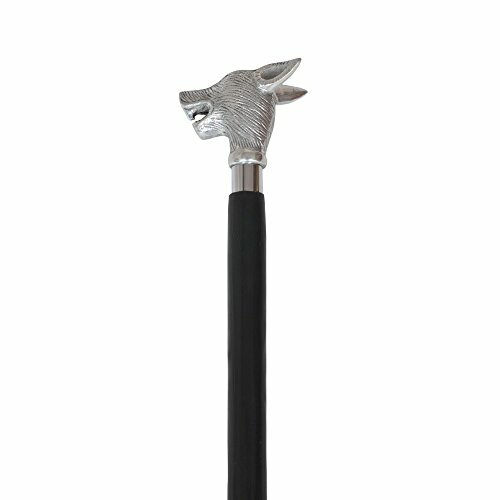 Benzara Black Lyptus Wood Cane Walking Stick with Silver Wolf's Head Handle by Benzara at Aulainter Americana. MPN: BM164223. Hurry! Limited time offer. Offer valid only while supplies last. This walking stick is made up of supreme quality lyptus wood orated by combined design wolf head aluminum handle that easily fits to any hand size. This walking stick is made up of supreme quality lyptus wood orated by combined design wolf head aluminum handle that easily fits to any hand size. Featuring a royal design, it can not only be used as a walking aid but also provides a magnetic charm to your style. Featuring a beautiful contrast of black and silver, it strikingly makes a connection. It has a rubber tip at the bottom providing it a great grip on the ground while you walk and can easily carries a weight of 70-80 Kgs; Ideal for both men and women. Featuring brushed wolf head handle that smoothly adjusts in the user's hand. It is made up of lyptus wood with an incredible craftsmanship. It has a sturdy construction due to which it lasts long. Slip-resistant rubber tip for additional traction and stability, making a great grip on the ground. It gives a royal look while holding. With the dimension 3.5X2.25X37 inch, it is considered ideal for both men and women. Walking stick is a good option for having support when no one is around. It also makes you independent.